When Jesus heals a deaf, mute man, He fulfills an old prophecy in a startling, unexpected way. How? St. Mark describes for us an episode that took place while Jesus was ministering in a primarily Gentile region (the Decapolis). “People brought to Him a deaf man who had a speech impediment and begged Him to lay His hand on him.” We don’t know if these were Jews or Gentiles, but we do know that this was an earnest intercession for a needy person. Because so much of our own prayer lives, as well as that of the whole Church, is taken up with intercessions of exactly this sort, we would do well to pay careful attention to the outcome. Interestingly, Jesus takes the man who lived entirely in silence “off by himself away from the crowd.” Why did He want this to be such a personal encounter? Perhaps He wanted to avoid the heightened excitement of the crowd. Perhaps He wanted the man to remember His own healing touch more than the miracle of being able to hear and speak. Look at how personal and physical Jesus gets with the man. He “put His finger into the man’s ears.” Those familiar with Jewish history will know that sometimes God’s action in the world was described in terms of His “finger” (see Ex 8:19; 31:18; Ps 8:4; also see Lk 11:20). Then, “spitting, [He] touched his tongue.” What intimate contact this is! It placed something of Jesus’ Body, His spittle, into the man’s mouth. When we see how physical this act of healing becomes, we have some sense of appreciation that, in the Eucharist, Jesus still desires to heal us by actually coming into our bodies. Then, “He looked up to heaven and groaned, and said to him … ‘Be opened!’ (translated from Aramaic by St. Mark)” What was the glance to heaven and the groaning all about? Was it a foreshadowing, in Jesus’ own Body, of the Passion He would soon undergo in order for this man to be healed not just of deafness but of sin and death as well? Did the glance to His Father signal a communion of love as the Son worked to perfectly fulfill the Father’s mission? As we shall see in our first reading, long ago the prophets had spoken of a Messiah who would clear the ears of the deaf. Was Jesus’ groan one of both the ecstasy of His obedient love for His Father and acknowledgement of its high cost? 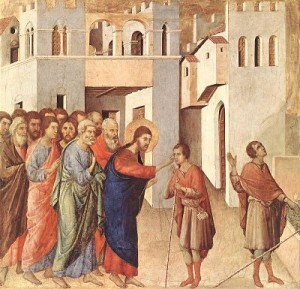 The man was immediately cured, but Jesus ordered everyone to keep quiet about it. Surely this was to avoid mass hysteria and sensationalism from spreading through the towns and villages where He traveled. In addition, Jesus didn’t want news about Him to travel too quickly to Jerusalem, triggering the fierce resistance He knew would come. He wanted time to do His work of preaching and teaching. He also wanted followers who were sincere, ready to follow Him even when He didn’t lift a single one of His powerful “fingers” to stop the Jews from arresting Him and the Romans from killing Him. The warning didn’t work. In fact, it had the opposite effect. “The more He ordered them not to [talk about it], the more they proclaimed it.” Perhaps His urgency over secrecy convinced them the message about Him really was very important. In any case, the people were “exceedingly astonished” by the miracle and said, “He has done all things well.” Their commentary reminds us the constant refrain of the Creation story, when God repeatedly pronounced His handiwork as “good.” This is appropriate, because as Jesus takes up the miraculous work of fulfilling all the prophecies about a Messiah who would heal God’s people, He begins the work of re-Creation, in which He aims to heal not simply physical infirmities but everything that keeps us deaf and blind to God, that cripples us in our walk with Him, and that prevents our tongues from singing a continual song of praise to Him. Possible response: Heavenly Father, thank You that You have already begun to fulfill Your promise of healing Your Creation. Help me be strong and fearless in the times when I struggle to see it. We should always be attentive to the lessons the poor can teach us. Possible response: Lord Jesus, please help me combat the temptation to show partiality. Help me be as gracious to the poor as You are to me.